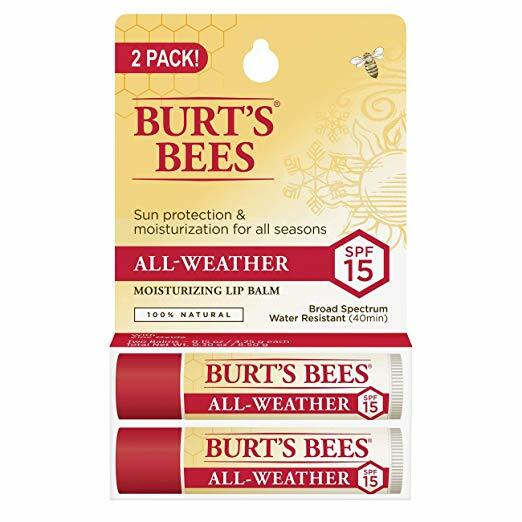 LIP CARE: Weather you’re hitting the ski slopes or relaxing on the beach, keep your lips protected with Burt’s Bees All-Weather SPF15 moisturizing Lip Balm. SPF LIP BALM: Infused with Zinc Oxide, this broad spectrum lip balm provides sunscreen benefits without leaving a white residue. MOISTURIZER: This conditioning lip care leaves your lips smooth and refreshed with a matte finish. WATER RESISTANT LIP BALM: Rain or shine, this lip balm with sunscreen is water resistant for up to 40 minutes so you can enjoy every season with healthy, happy lips.